We are thrilled to announce the long anticipated arrival of the 650 TWINS. Our demonstrator is in stock and ready to Rock N Roll. So for all you folks who wanted to see it in the flesh, come on down. At £5899 otr the price is right too!! , A ton of fun. 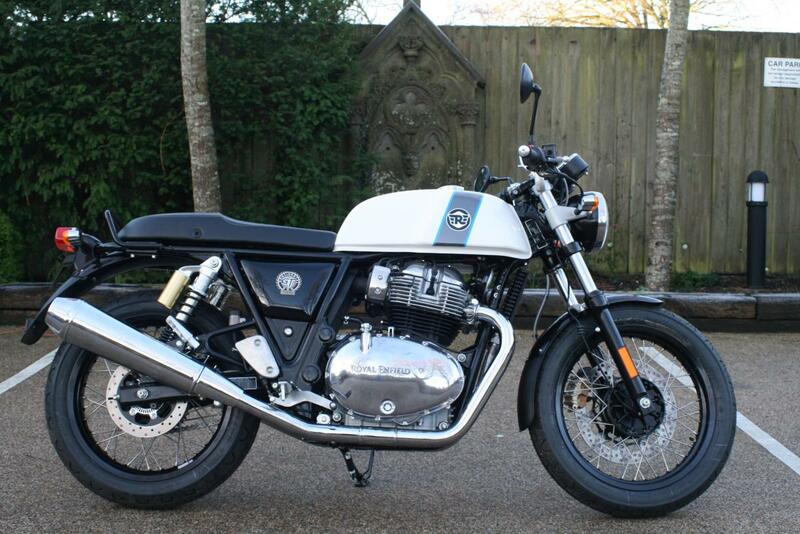 A modern interpretation of a cultural icon, part of the original British Cafe Racing Scene. An expression of free spirit and a declaration of style. Drawing inspiration from the cafe racers and cafe culture of the 1950's and 62's, the Continental GT 650 Twin recaptures the spirit of the original GT 250 and is the next evolution of Royal Enfield's GT Line. A design Icon in its own right, the perfect blend of tradition and modernity, it retains the classic split running through the motorcycle, separating the pure, mechanical details from the elegant forms of the fuel tank & seat. Thinking of a new classic retro styled bike, then think again. This new kid on the block will knock your socks off and the price will make even Scrooge crack a smile. So saddle up and come on over, you know it makes sense. Low rate finance is available on this bike, credit subject to acceptance. For a no obligation finance quote, please call 01747 811196 and select option 1 for sales. Thanks for looking! !